If you own a credit card, it is easy to apply for a personal loan on credit card when you are in need of immediate funds. Credit card loans are pre-approved, unsecured loans, which often do not need documentation. Therefore, they are the quickest way to raise funds to cover your financial needs. It’s a common misconception to think that if you apply for a loan on your credit card, the bank will increase the credit limit on your card and allow you to withdraw the cash through your card. The fact is that a loan on your credit card is a kind of a personal loan that the bank provides you against your existing credit card. The amount you can borrow is up to your lender. There is also another option of cash withdrawal from your credit card that you can consider, which often does not need documentation. Therefore, they are the quickest way to raise funds to cover your financial needs. Credit cards often allow you to withdraw cash equivalent to anywhere between 40-80% of your credit card limit, with a cap on your daily limits as well in certain cases. And if you go above the credit limit, you will need to pay an over-limit fee and also the usual interest rate on a cash advance. MoneyTap’s monthly rate of interest at 1.08-2.33% is comparatively lower than other credit cards, which are typically at 2.5% per month. 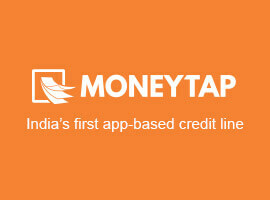 MoneyTap is the only credit card in India that allows 100% cash withdrawal. You can withdraw 100% cash from your approved credit line anytime from anywhere with an option to transfer it to your bank account. How MoneyTap Credit Card 2.0 works. Rahul’s best friend needed ₹ 1.5 Lakh immediately for an emergency. Rahul wanted to help his best friend in his time of need. He thought of using his credit card which had a credit limit of ₹ 2 Lakh. However, he was disappointed to know that he could withdraw only 40% of his credit limit that amounts to ₹ 80,000, which doesn’t meet his friend’s current requirement. While researching online, he came across MoneyTap which offered him an instant credit card with 100% cash withdrawal and he had to pay only 1.08% interest per month (13% per annum) as compared to the traditional credit cards where he would have paid as high as 2.5-3% per month (30% – 36% per annum). So, what do you think Rahul did? What would you do? Rahul, for obvious reasons, chose to get MoneyTap’s personal line of credit with a credit card. He was able to get instant approval, and MoneyTap Credit Card 2.0 is the only credit card in India to offer 100% cash-withdrawal. He had 24×7 access to money with an option to transfer it to their bank account. Not only was he able to help a friend in need, but also had leftover available credit for his own needs. Not just that, his credit set back to the entire amount as he paid his EMIs. What is your plan of action when you do not have sufficient funds and you are in need of immediate cash or credit? A personal loan on a credit card is when you borrow against your credit card limit and often, it is a viable and quick option for funds, but at times, the terms of the credit card company might be so that the loan against the credit card could be limited or have other terms attached. Save money on interest and withdraw as much as you need from your personal line of credit at any time and from anywhere. Apply for MoneyTap Credit Card 2.0. Can anyone with a credit card get a loan? No. When it comes to credit card loans, each bank or issuer has its own eligibility criteria. The loan on credit card is offered to select cardholders and is based on his/her credit standing and credit repayment history. What are the advantages of a loan on credit card? Instant cash whenever you need. Attractive and reduced rates of interest than interest on cash withdrawals on credit card. Fast processing and quick disbursal upon approval. Can apply for it online from anywhere at any time. Repay the loan in monthly instalments. What is the difference between withdrawing cash from a credit card and getting a loan on credit card? The major difference is in the interest charged. Banks charge a higher rate of interest on cash withdrawals on credit card as compared to a loan against a credit card. With MoneyTap, the interest charged on cash withdrawals and personal loan on credit card is 1.08% to 2.33% per month. Can I convert all my purchases to EMI with MoneyTap loan on credit card? Yes. With MoneyTap you can convert all your purchases above ₹ 3,000 to EMIs. The benefits of a credit card and a personal loan are rolled into one with MoneyTap's personal line of credit. Get your credit line today.